In the meantime, the Acer Timeline Series is available in several configurations and case sizes, whereas a persistently slim and light design is used. Acer’s motto: mobile, efficient devices at a low price, but which have enough computing power, anyway. Can the 1.71 kg light 13.3" subnotebook, with a declared 8 hour battery life deemed for business customers, keep this promise? The following review will reveal if it can stand up to these expectations. Acer supplies the cheapest available "Business Timeline" alternative with Linpus-Linux, Intel Core 2 Duo SU 3500, 2 GB RAM, 160 GB hard disk and a 13.3" non-glare display for less than 500 Euros. With this, it's roughly 100 Euros cheaper than its identically configured Window Vista alternative. There are a total of 5 different configurations available at the moment, which, only vary significantly from each other in view of CPU, RAM configuration and hard disk capacity. Alternatives with an ATI HD4330 graphic chip and/or UMTS module are supposed to come next. 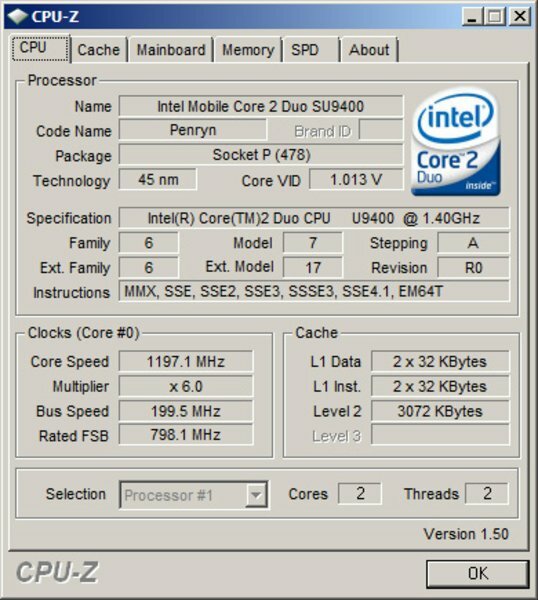 An obvious mark up becomes evident as soon as the dual core CPU, the Intel Core 2 Duo SU9400, is used and the package then has a price short of 800 Euros. Our test model has the core components with the mentioned SU9400 CPU, 4GB DDR3 RAM, a 320 GB hard disk and includes the Windows Vista business as the operating system. The Travelmate's matt gray-black case will delight those who have put the very sensitive high gloss surfaces of current notebooks in question. There will scarcely be any reason for fretting about fingerprints, fine scratches and noticeable dust collections with the roughened, resistant outer skin of the 8371. Although it's been positioned in the business customer field, exactly just these characteristics could let the one or other frustrated home user prick their ears. A further bonus point is the good case quality. The base unit and display lid are very well-manufactured and there aren't any deviating gaps to be seen. The chassis' pressure resistance and torsional stiffness is very high and provides for a solid quality impression. Particularly, the palm rests aren't deformable at even strong pressure. The assembly of chassis and display is also of the desirable stability and the retentive hinges do good persuasion work. However, one disadvantage of this construction is the limited, and for some applications fields unfavorable, opening angle. Unfortunately, the display lid can't quite keep up to the otherwise high material standards of the other components and can already be twisted and bent with little pressure. But we couldn't establish any restrictions in view of the screen protection functionality and it shouldn't cause any drawbacks at normal use. Despite a missing, separate closing mechanism, the display closes concisely and prevents an unintentional opening during transportation. Our test model weighing 1.71 kg can't quite confirm the declared 1.65 kg, but it's still a good value for a 13" notebook, anyway. The omitted optical drive will have contributed to this substantially, and may also represent a certain discommodity for some users. 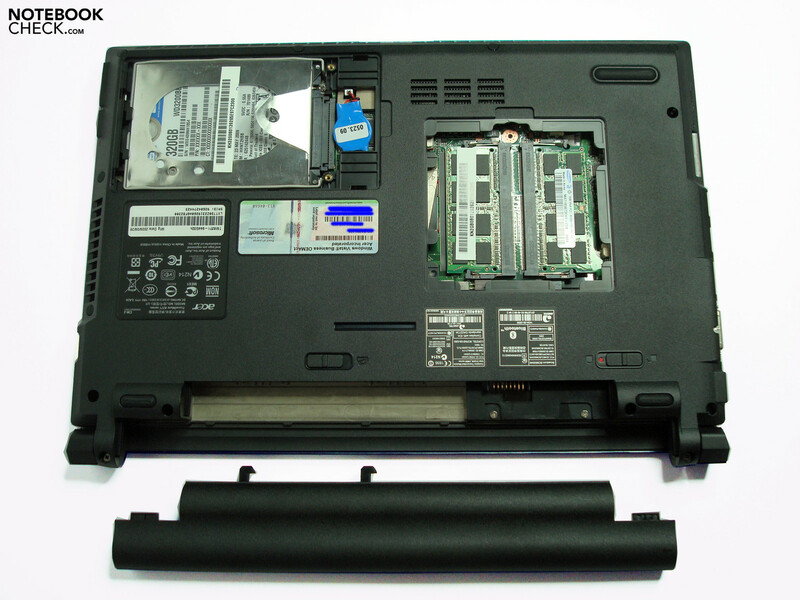 The bottom side accommodates the usual openings for accessing the upgradable components. However, this won't be a crucial necessity in our test model, as it already has a good configuration of 320 GB hard disk and 4GBs RAM. The Travelmate has, in accordance to its product alignment, a solid measure of interfaces. 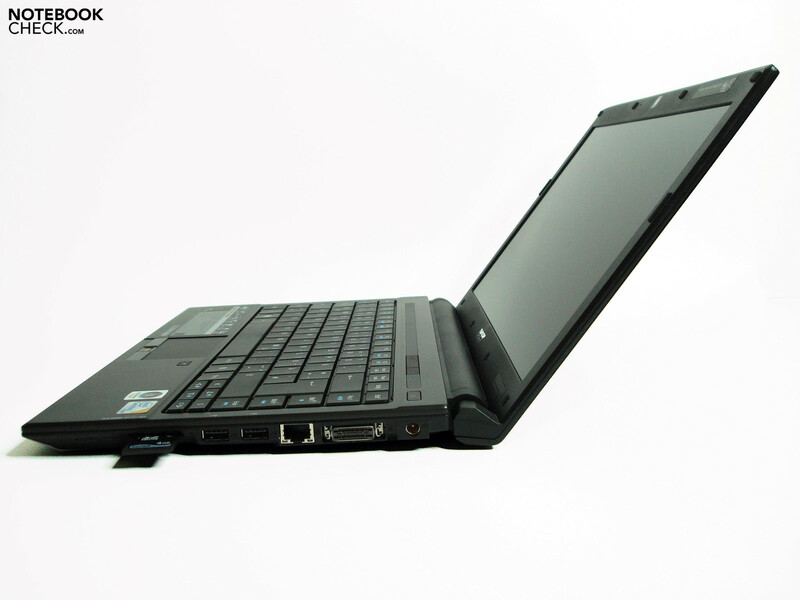 Most peripherals, such as USB hard disks, cameras, printers, etc., can be connected to the notebook via 3x USB 2.0, VGA, Gigabit-LAN, Multi-Card-Reader (SD, SDHC, MMS, MMS Pro, XD-Card). However, the user has to waiver on faster interfaces, such as Firewire or eSATA, which have established themselves in the field of video or for a faster accessibility to external hard disks. 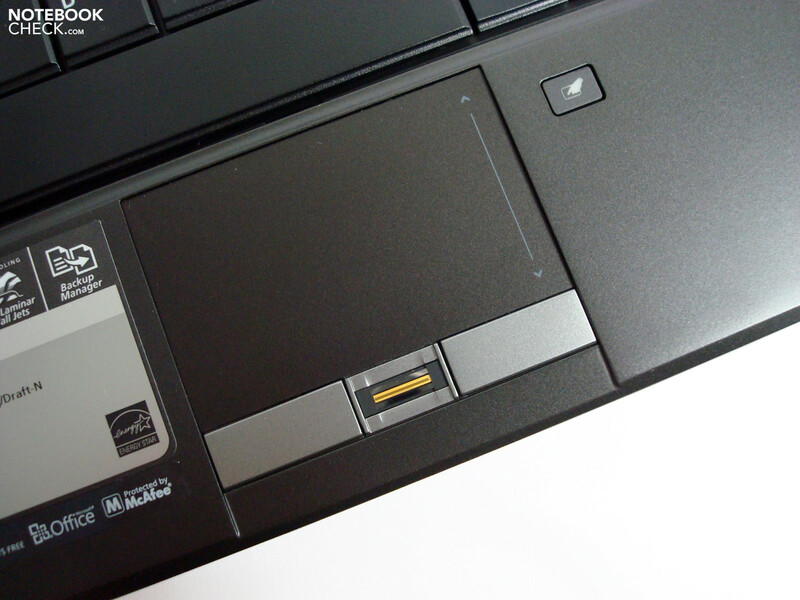 An upgrade isn't possible either, due to the omission of an Expresscard slot. Contemporary wireless standards are also supplied via draft-n WLAN and Bluetooth 2.1+EDR and lack at most the heretofore missing UMTS option. This seems to be very probable in future configurations, as Acer already has the fitting UMTS 3G drivers for Qualcomm modules on its support site. The equipment is rounded off by a webcam, which has become standard, a docking port and a fingerprint scanner - very much appreciated in business devices. As in netbooks, the user has to waiver on an optical drive and must fall back on an external solution when this is required. 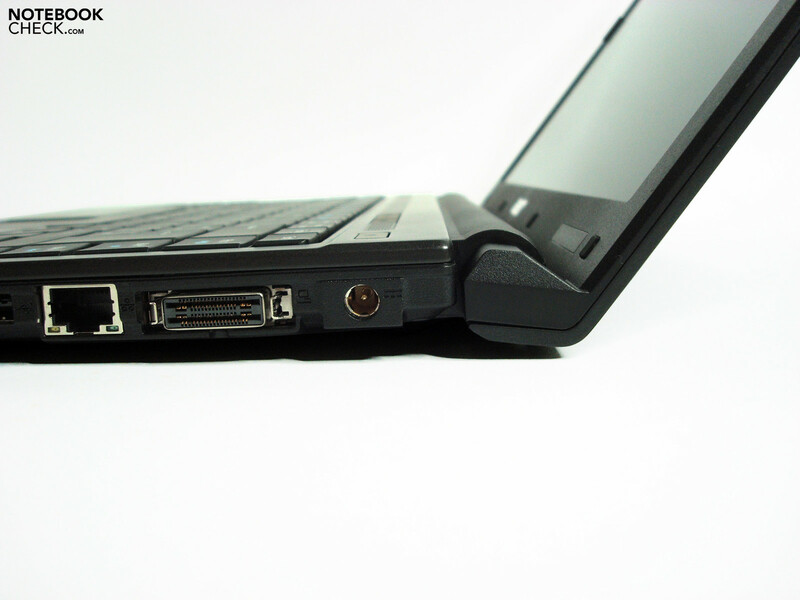 The ports have also been distributed in a netbook manner. As the back is entirely occupied by the 62 Wh battery and therefore doesn't leave any room for connections, the front has also been exempted from interfaces for other, if not aesthetic reasons. 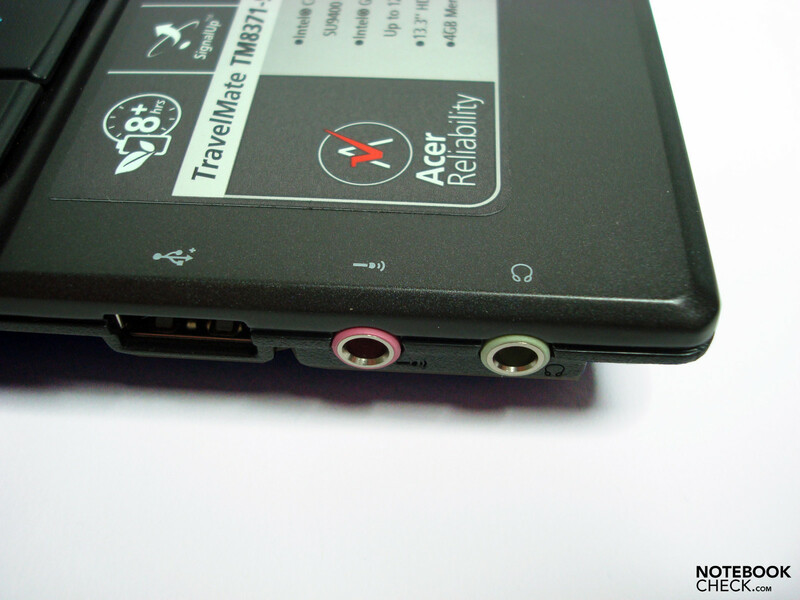 We would have preferred to have the audio ports here. They would have felt at home in this place, in view of such practical aspects as Skype, listening to music and similar tasks. These are found, like all other sockets, distributed quite satisfactorily on the sides. 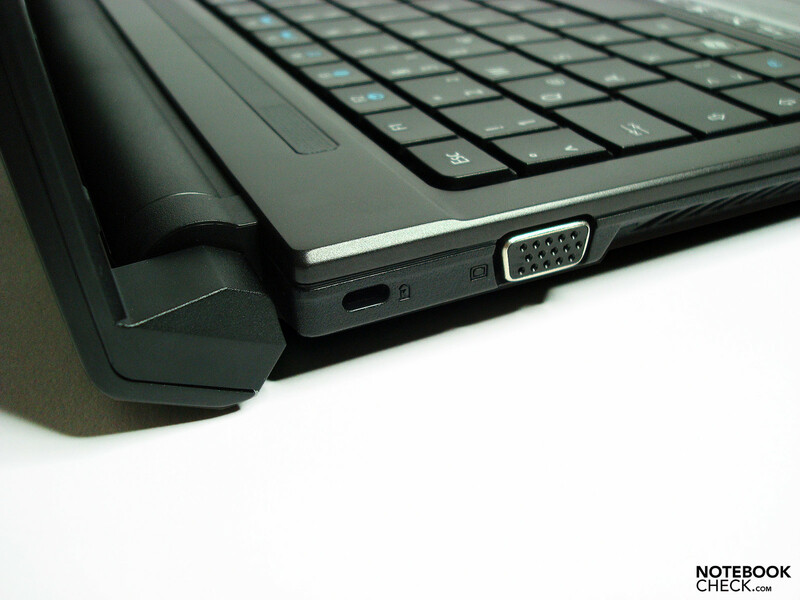 VGA, LAN, power socket and docking port are placed well in the far back, and therefore, aren't interfering in everyday use - even with connected cables. The USB ports placed in the center right are still acceptably far in the back and shouldn't cause any conflicts with the right hand in most cases. 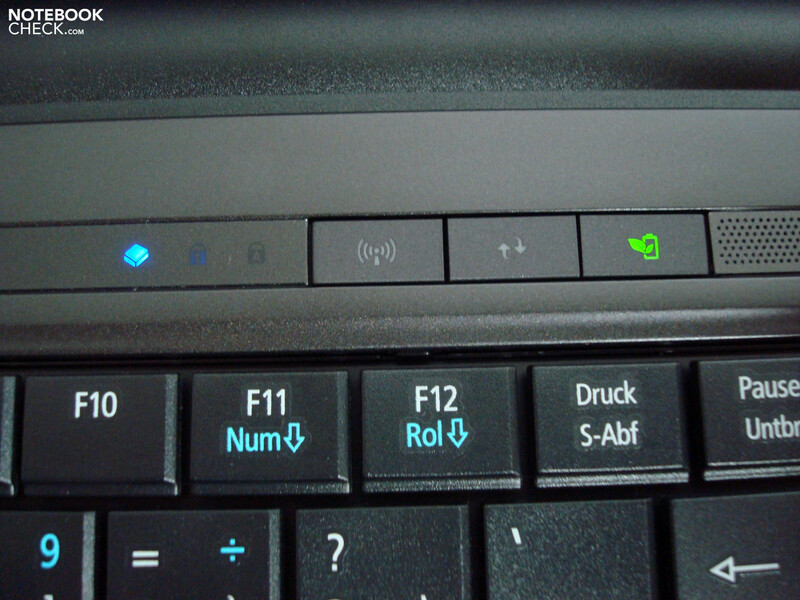 Connected peripheral equipment, especially the use of a mouse, could turn out to be cumbersome for lefties, as the audio sockets and the adjacent third USB port are placed far front. 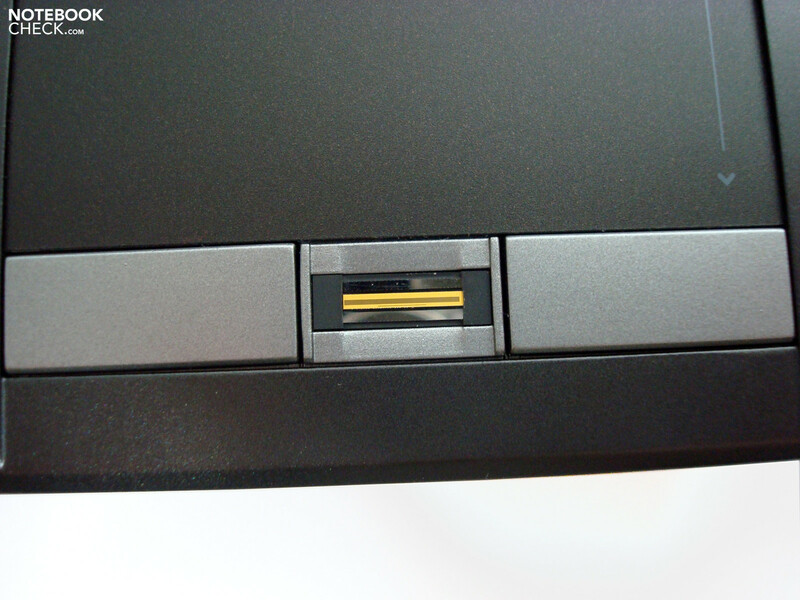 A special feature, which may be important for some customers, is the docking station port that makes a fast connection to stationary peripherals possible. 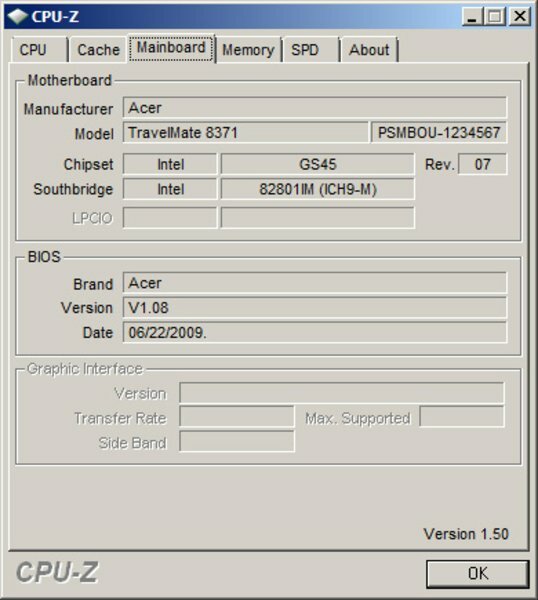 Acer's 68 Pin connection is employed for this. It's already known from other models and can connect the Acer Easy Dock IV extension and recharge the battery at the same time. Aside from a Gigabit LAN, audio VGA and 4x USBs, external displays can also be digitally attached via DVI-D. This can be added and removed during operating via plug & play and has a street price starting at around 90 Euros. A cheap and comfortable extension option. The software equipment of our test model is to be described as very meager. Aside from Windows Vista Business 32bit and a few smaller "Acer-helpers", there is only a 60 day test version of McAfee's virus scanner and the office package Microsoft Office installed. The included Windows XP Professional downgrade DVD that is included, with which Windows Vista can be waivered on if wanted, should be interesting for a few companies and users who still rely on Windows XP. There isn't any system media supplied for the preinstalled Vista Business and therefore, it has to be created by the user. The normal-sized keyboard, which profits from the case size, bids a medium-short stroke length and a good key layout. 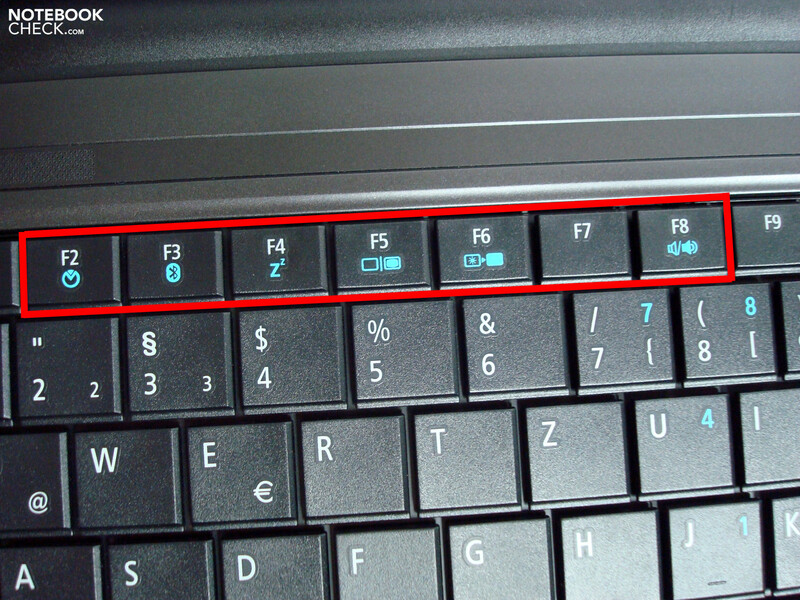 All necessary functions are found directly in the hotkey bar above the actual keyboard or via FN key combinations in the F-key row. The rich in contrast lettering is pleasing, as they allow for the recognition of the figures for a long time, even in unfavorable light conditions. The stroke is generally pleasant and should satisfy touch-typists after a short accommodation period, as well. 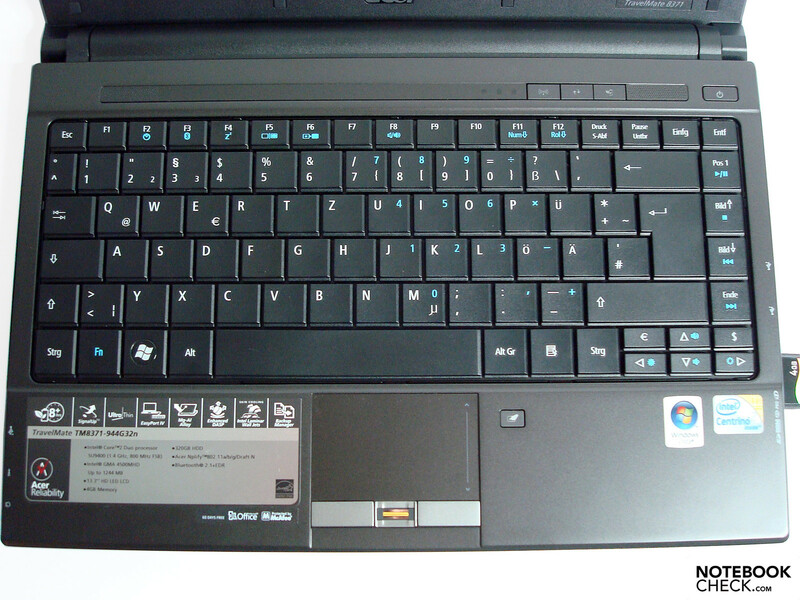 The subjectively slightly loud key noise will most probably disturb noise-sensitive natures and the clattery-sounding space bar won't appeal to other users in the long run, either. 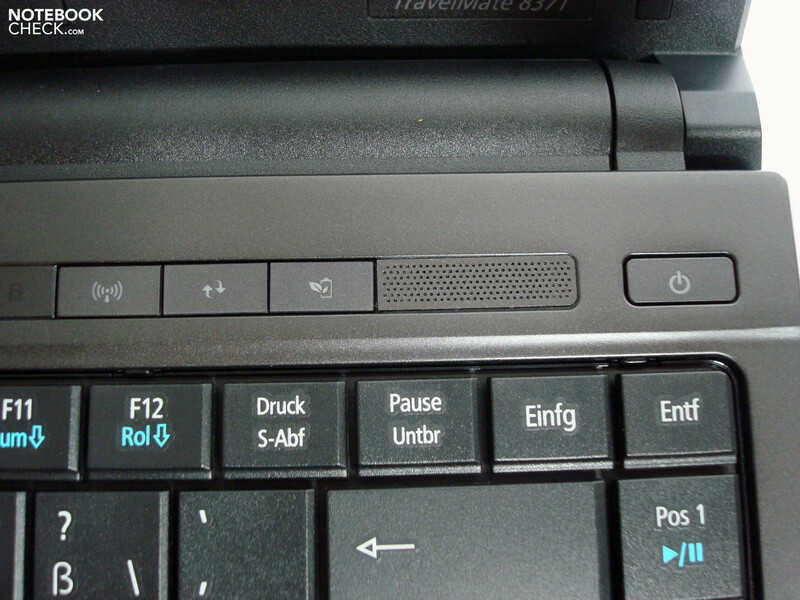 The enter key can be bent through to an extent at average pressure, teeters minimally at typing, but still has enough feedback for most tastes. If possible, frequent writers should permit themselves an extended trial to attain certainty in view of feedback and key noise. 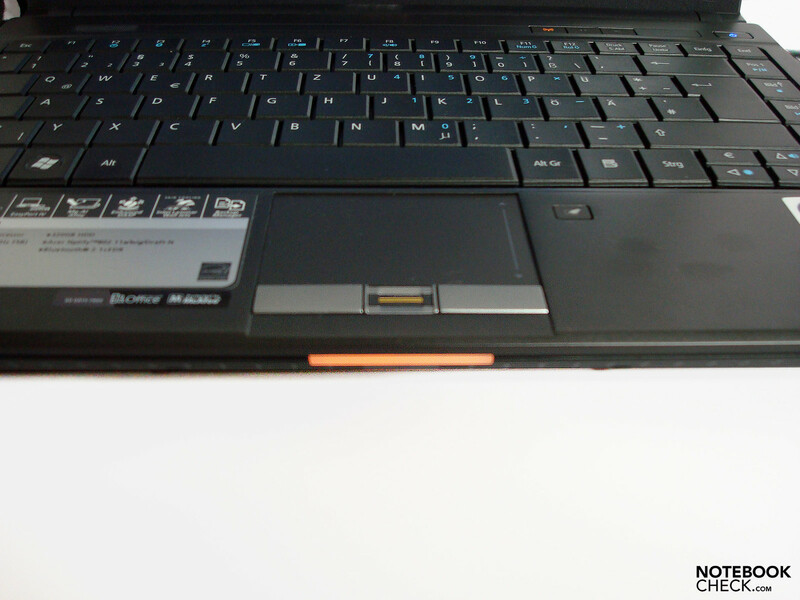 The touchpad has a pleasant, slightly roughened surface with a sufficiently sized input surface. The response sensitivity is good and the other setting options quite circumferential, as already known from synaptic pads. A few multi-touch functions like scrolling, zooming etc. are also given. 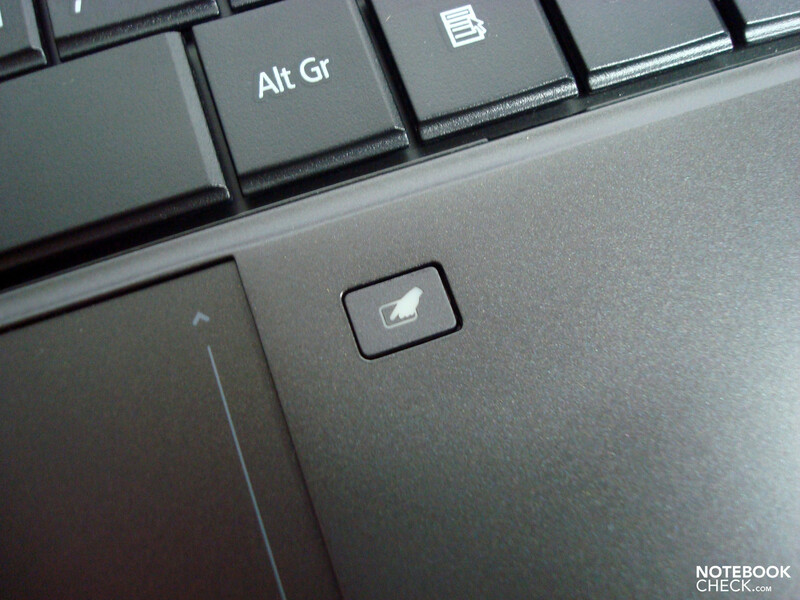 When necessary, the touchpad can be completely deactivated by a button placed on the right. 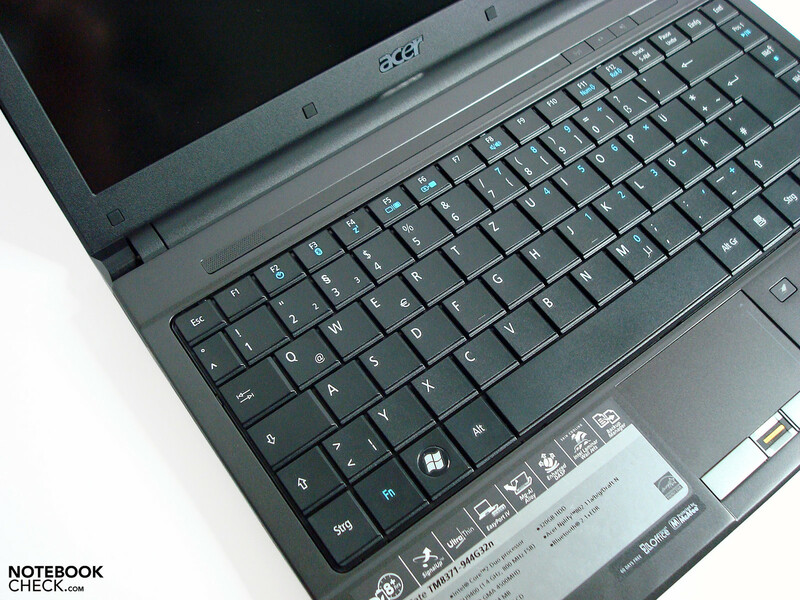 The touchpad keys are separated by the integrated fingerprint reader and can be used well. The pressure point, as well as the response sensitivity, is pleasant and there isn't anything standing in the way of a longer use. While the left key has been manufactured optimally, we established a somewhat clattery bezel for its right counterpart. But that is probably restricted to this test model. It didn't lead to any functional restrictions. The Travelmate might have a 16:9 LED display, just like its Timeline colleagues from the Aspire range, but has been, in opposition, treated to a non-glare surface from Acer. This isn't, as it is usually common, roughened; instead it seems to have a anti-reflective coating, which allows silhouettes of reflections in a deactivated state. These disappear as soon as the backlight is turned on, though. The display fulfills the HD-ready guidelines with a native resolution of 1366x768 pixels, which contributes to fewer black bars in multimedia mode. 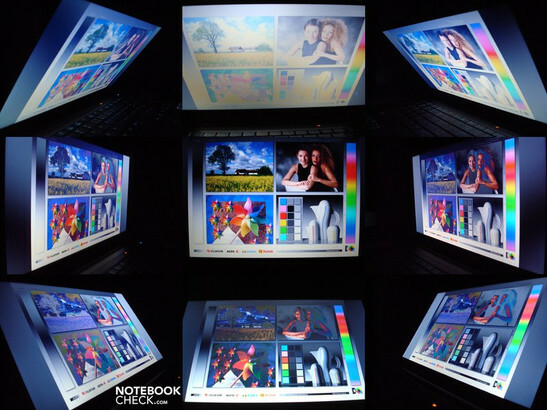 Acer discerns the LED display of the Acer Travelmate 8371, amongst other things, as a component especially responsible for the low power consumption on its homepage. Fortunately, this hasn't been accomplished by an exaggerated backlight restriction. With an established illumination of 87% and brightness values with an average of maximally 187 cd/m2, the display scores good to very good results in these sectors. Thus, there is barely anything standing in the way of operating in adverse light conditions or outdoors (in consideration of solar radiation). The LED backlight is merely too weak for an unlimited outdoor use in full sun or with direct solar radiation. Good: The full brightness is available in battery mode. As in many previously tested displays, the contrast values of 163:1 and the visibly faint colors weren't very impressive. This isn't significant for most office and business applications, especially in view of the product alignment, but for users with ambitions in the field of movies, photos, image editing it isn't very advantageous. Black looks more like gray and the colors lack saturation. The viewing angle stability is quite stable, except for color nuance deviations on the horizontal axis and allows for a good image recognition out of even greater angles. The vertical viewing angle stability is only optimal in a very narrow range. An intense color bleaching in the upper area or a strong reversal of the display content from lower viewing angles is already provoked at both slight changes of the sitting position and display inclination angle. We tested the VGA output's quality at a resolution of 1280 x 1024 and 168 x 1050 and it rendered a subjectively very good, sharp image. The common formats of 1440x900, 1600x900 and 1920x1080 are supported from Timeline and thus cover a wide spectrum of display resolutions used at present. As usual, the resolutions on unsupported foreign displays have a decrease of clarity and are often presented slightly unfocused (depending on the display). In a direct comparison, the display of our Travelmate Timeline 8371 at hand scores better than the Aspire Timeline 3810 in many sections. While the lower contrast ratio of 153:1 scarcely has an effect, the uneven illumination of 68% is already quite visible, depending on the displayed content. The reflective surface is also irritating, depending on the existing light conditions, and distracts from the essential focus of attention. The better brightness values, due to the reflective surface, can't reimburse this much and lets the Aspire display to fall back greatly in a direct comparison to our 8371 test model. 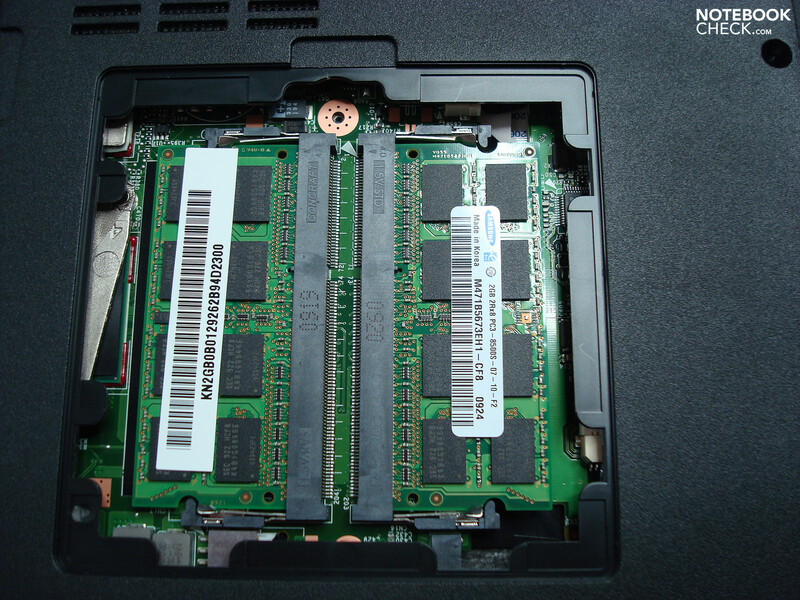 Our test model has a target group suitable configuration and can fall back on an Intel Core 2 Duo dual core CPU SU9400 with a, 3MB L2 cache and 1.4 GHz clock rate, a 4 GB RAM from Samsung, a 320 GB hard disk from Western Digital, which has a velocity of 5400 rpm, and an integrated Intel GMA 4500MHD graphic chip. These components, clearly orientated on energy efficiency, also have enough power for the conceived tasks. 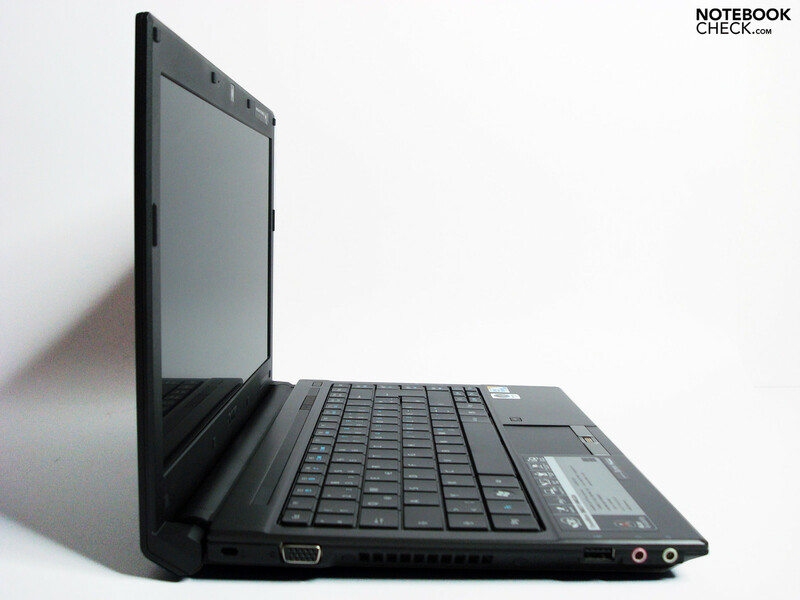 They create a clearly defined span, especially to the 12" netbooks or the CULV single core competitors of the new slimline category, like the MSI X340 or the Lenovo Ideapad U350, which aren't very much cheaper. Although the 620 points in the 3DMark'06 echo a manifold of the performance, in comparison to the competitor models with an Intel GMA950, X3100 or GMA500, the Intel GMA 4500MHD used in the test model isn't suitable for 3D-biased applications like games or CAD programs based on OpenGL. However, it does nevertheless help the system to a studder-free rendering of FullHD material via video players with dxva-support (i.e. Cyberlinks Power DVD) when hardware acceleration is used. In any case, the system has enough reserves for the rendering of our iTunes H.264 movies. It played our iTunes test movie "Shooter" (853x354) just as smooth as the movie "Seven" (754x322), which we converted into a H.264 format. 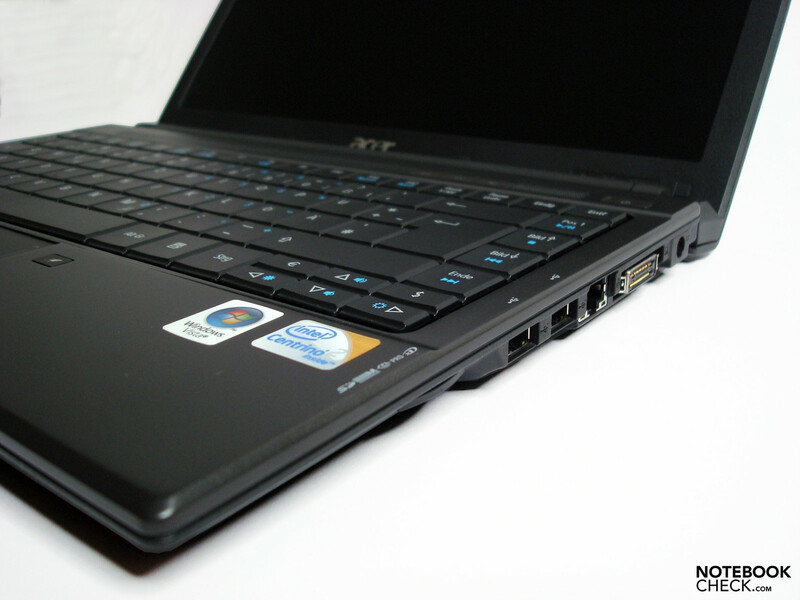 Similar to the Aspire Timeline 3810T, future planned alternatives with an ATI HD4330 should supply an evident boost in the field of graphic performance. It should, however, be considered that it will have a significant effect on the system noise, heat development and battery life. It also can't hold a candle to the performance capabilities of current notebook middle class graphic chips and makes this option appear to be sensible for only a small consumer base. 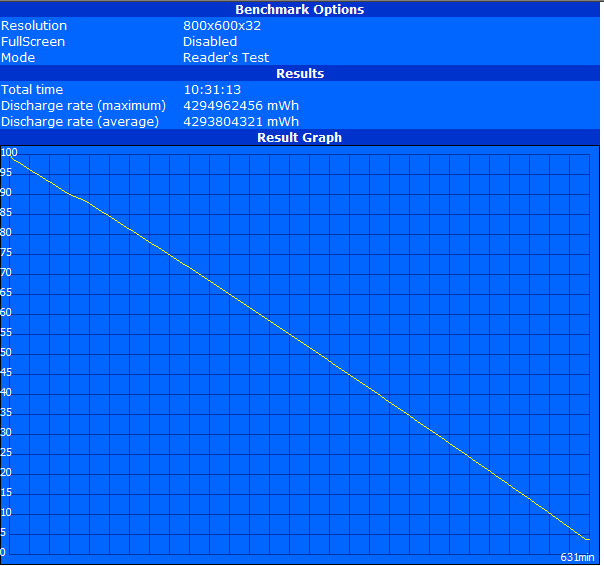 It can be trusted on sufficient computing resources because of the CPU performance, not only due to the two cores. 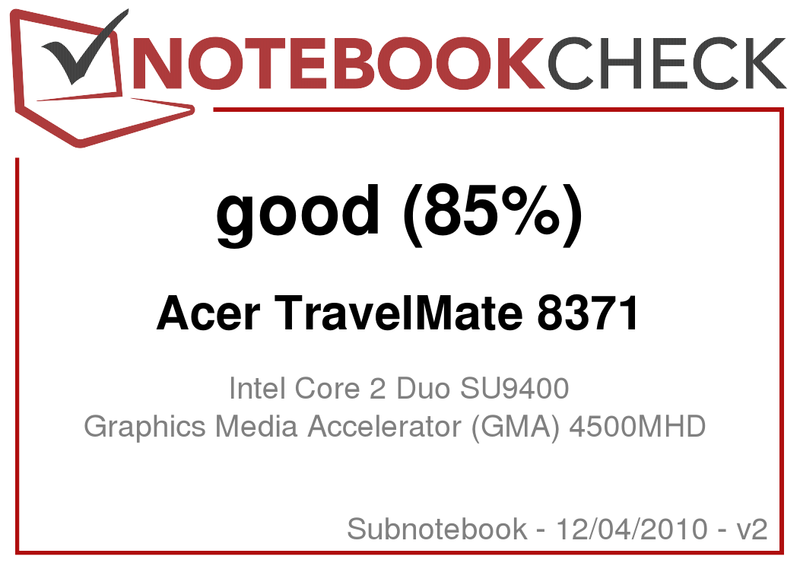 While the already evaluated Acer Aspire Timeline 3810 with a single core CPU SU3500 still seemed to be rather slow, we didn't feel restrained by the Travelmate with a SU9400 processor in daily basic tasks at any time. Browser, office, music via iTunes, the virus program on side: no problem. 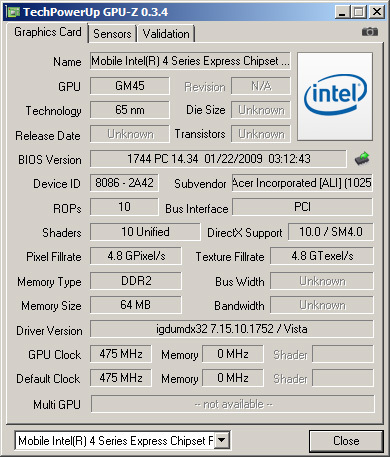 However, the limits are noticed when it's about pure processor performance. The Intel Core 2 Duo CPU could achieve a distinct 14.5-fold lead to the Atom CPUs at converting our test songs from MP3 to AAC via iTunes. 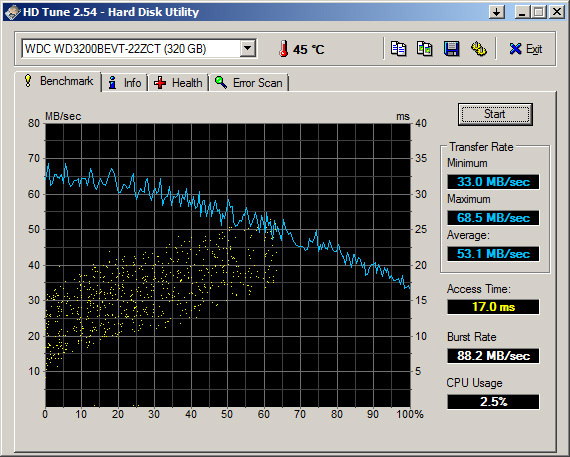 Then again, in opposition to a P7230 CPU, which achieves about a 23.5-fold velocity, it lags far behind. Image editing with simple tools is quickly and easily done and can also be managed quite practically with the existing display size. The overall interface performance can be called good and supplies comfortable velocities with 27.2 MB/s via USB, 18.5 MB/s via SD/SDHC and 7.1 MB/s via XD PictureCard with the cardreader. The Western Digital S-ATA hard disk has a capacity of 320GB, works with 5400 rpm and also gives good results with an average transfer rate of 51.9 MB/s. 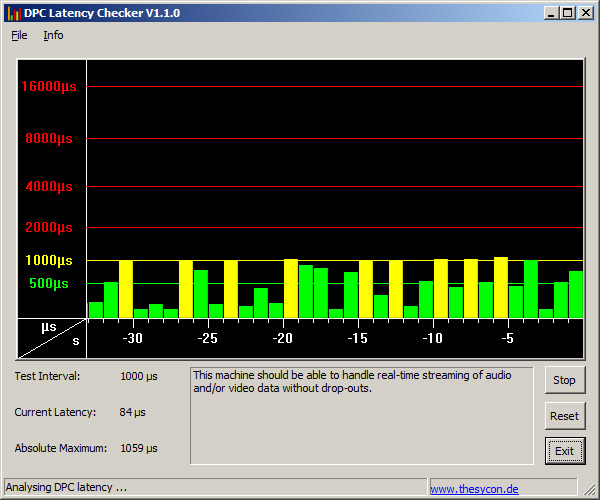 We also checked the latencies under windows with the DPC Latency Checker tool. These were mostly within a limit and reached a maximum of 1000 µs. Therefore, problems synchronizing external devices, for example sound crackling with external sound cards, shouldn't turn up. 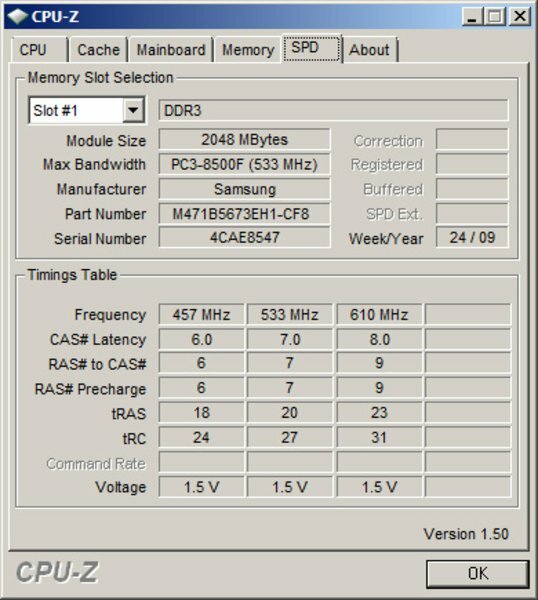 The test device is barely audible with 31.2 dB(A) in battery mode and attracts attention only at hard disk access with 34.3 dB(A). 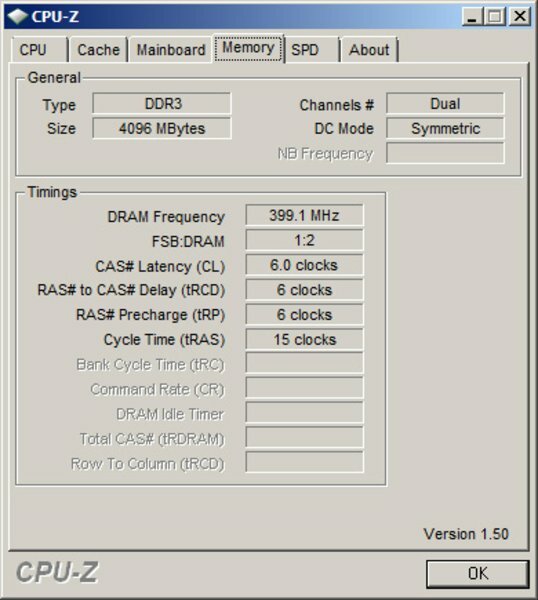 In return, the candidate becomes very existent with 33.7 dB(A) as soon as the adapter is connected. The fan then runs with a sonorous whirring almost consistently in the background. This should still be within an agreeable range for most users; merely sensitive ears should execute a trial run, just in case. Furthermore, the consistant fan characteristic has to be mentioned positively here, which is barely noticed after a while - in opposition to more fast-paced colleagues. The notebook achieves a volume of 35.8 db(A) in the middle load field, which occurs at rendering HD movies, for instance. Due to the low maximum loudspeaker volume, this leads to an according impairment in quiet movie sequences. An unpleasant 39.7 dB(A) has to be put up with under load, which is still bearable for a short period of time, but isn't amusing in the long run. The case temperatures stay within a limit at a maximum of 38.8°C in the keyboard area and 42.2°C selectively on the bottom side and probably won't give reason for restriction even with continuous load. The values decrease by 5-7°C when the energy savings options is activated, which then can be generally called very cool. The adapter develops the usual temperature of 47°C after some period of use. The Travelmate's loudspeakers take the product alignment very seriously and therefore, don't bid any multimedia suitability whatsoever. The mono speaker doesn't supply any basses or middles. Therefore, it's barely suitable for relaxing background music. To underline possible projects with sound also fails, due to the way to low maximum volume. USB loudspeaker or headphones should therefore have their safe place in the notebook bag. Aside from various characteristic logos on the palm rests, there is a symbol boasting for a battery life of 8 hours. Acer doesn't swindle with this in opposition to other manufacturers. 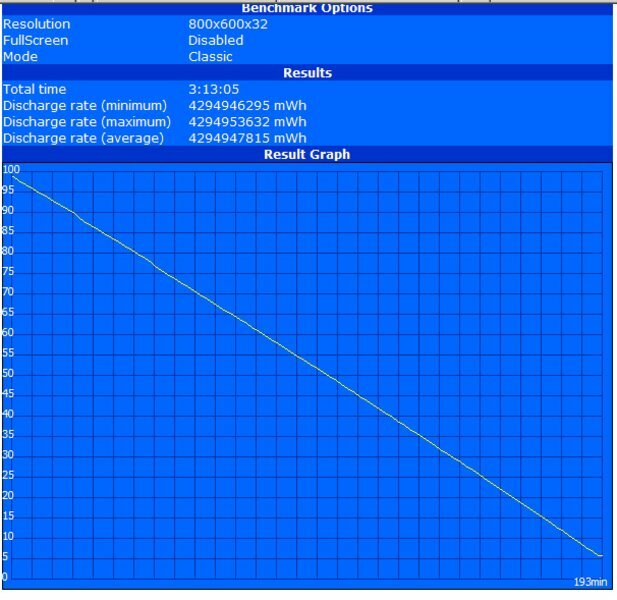 We could establish a power consumption of 8.3 Watt up to 26.6 Watt in our measurements. The PowerSmart-Savings profile, only available in battery mode, also decreases the power consumption obviously to an evaluated 5.9 Watt. This is also the base of our usual BatteryEater Reader's test for establishing the maximum possible runtime (energy savings mode, display with minimum brightness, all additional components off). The manufacturer's declaration of 8 hours wasn't only reached, but also surpassed it considerably with 10.5 hours. Even in the practical "WLAN Browser Test" with adapted display brightness, we achieved a bit more than 7 hours of mains independency. 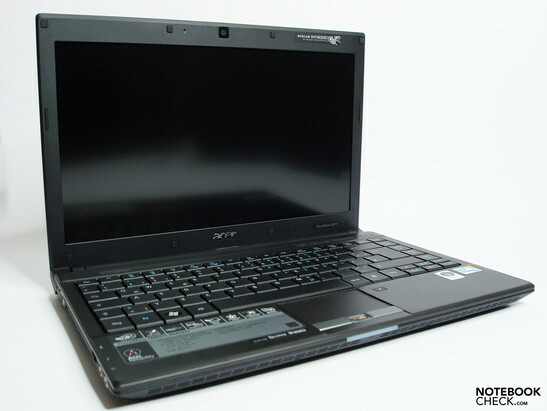 Therewith, the Acer Timeline derivate doesn't only advance into the field of expensive netbooks, but what will be even more painful for some manufacturers, into the sector of the lucrative subnotebooks. Playing movie files via hard disk (instead of an optical drive) is possible for 285 minutes and can make an over averagely long video-night possible. 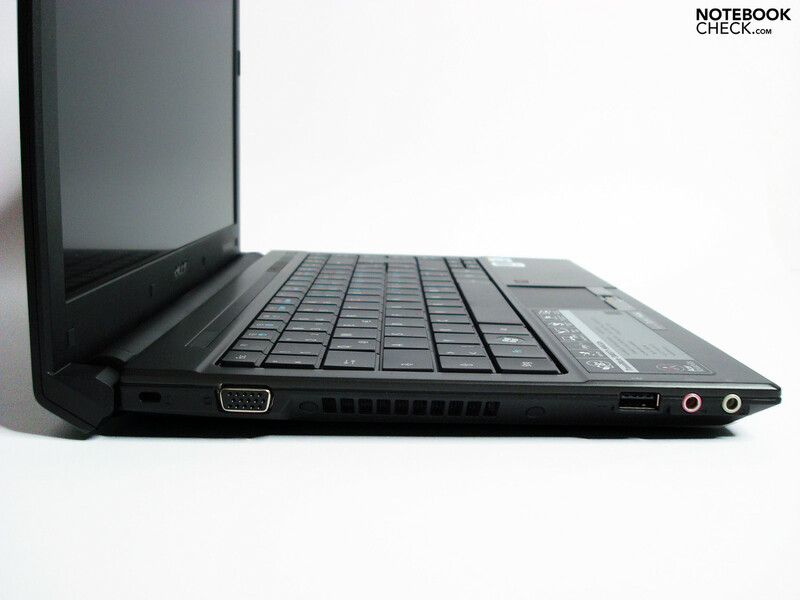 The 13" notebook treats itself to considerably more under load and reaches 193 min. in the BatteryEater's Classic test (minimum possible runtime, display full brightness, all components on). 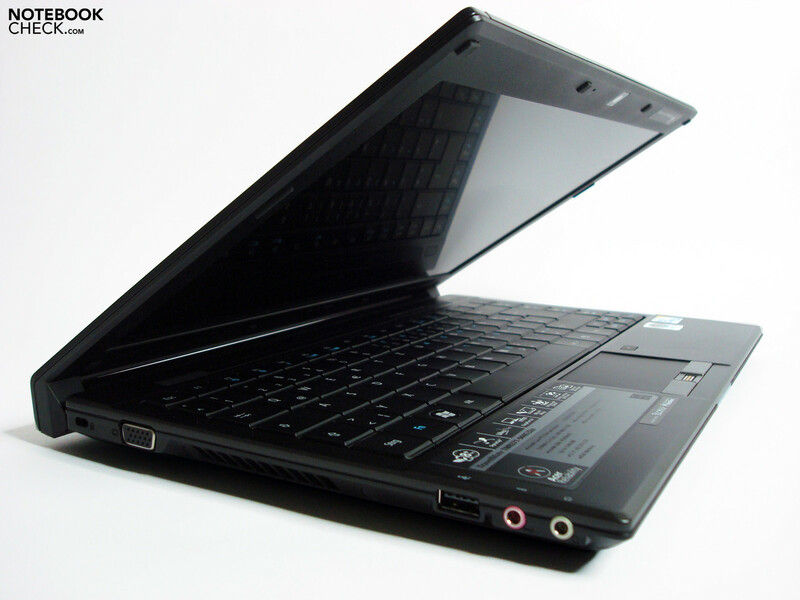 Basically, the 13" subnotebook can boast with a very good battery life and, depending on the application field, survive a work day. We also executed the screen saver test on this model and measured a power consumption of 17.2 Watt with the preinstalled Acer screensaver. This leads to a considerable runtime decrease especially in battery mode and should therefore be replaced by the display deactivation (energy savings settings!). 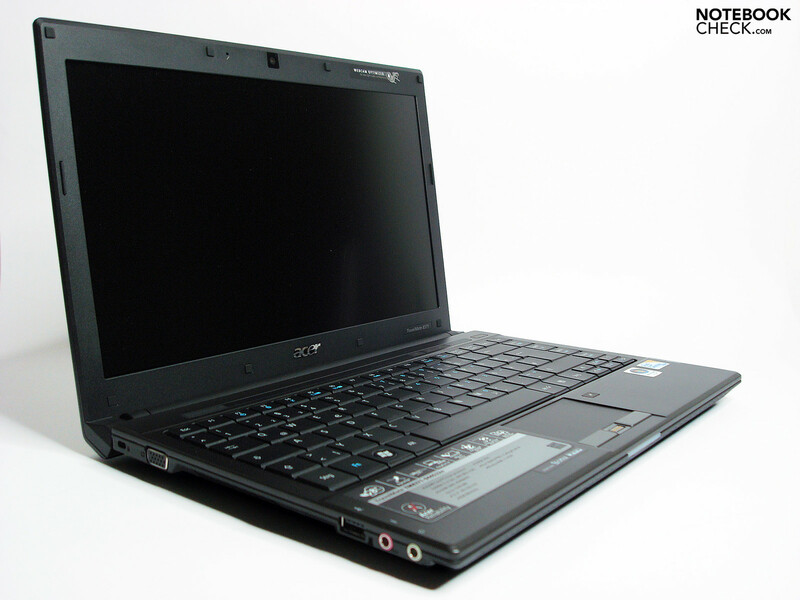 The Acer Travelmate 8371 is an interesting alternative to its sister models in the Aspire range. Except for the not yet available dedicated graphic and the UMTS module, it can do everything almost as good and has, beyond that, the one or other substantial additional argument. An advantage is the anti-glare display, which can boast with a far better brightness distribution and slightly better contrast values, beside other similar basic characteristics. 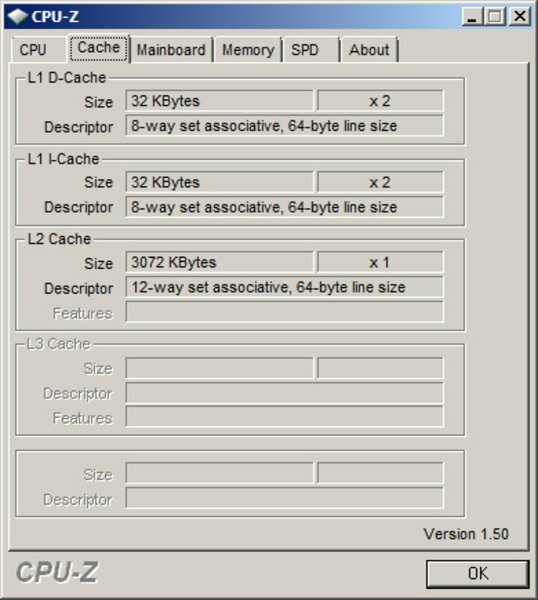 The hardware configuration with a 2 core CPU is also considerably more practice suitable. This especially allows for an obvious increase of work speed at simultaneous running applications. 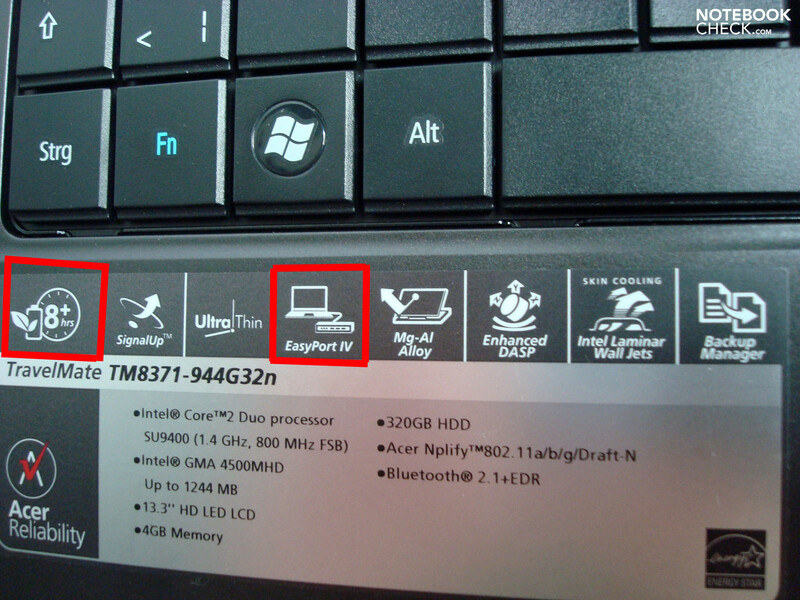 Not vital for everyone: the docking option, Windows Vista Business (instead of Home Premium) with a downgrade option to Windows XP Professional and the fingerprint reader. The omitted HDMI port isn't only painful for home users, as especially high resolution displays are preferably connected digitally at the office. 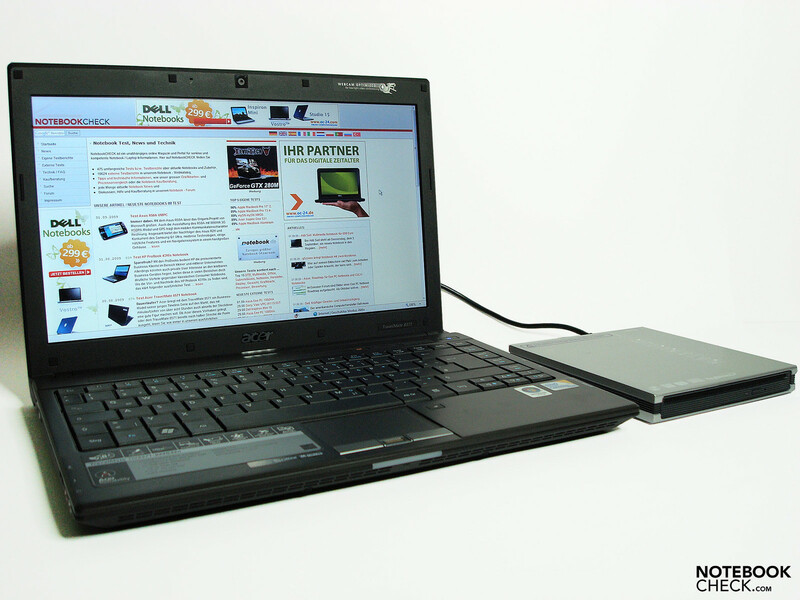 The missing optical drive will prevent the one or other user from a purchase because an external device presents itself as inconvenient particularly at mobile use. The main critique point is the somewhat higher system noise in the load scenarios, which can get disagreeable in the long run. The buyer is, however, reimbursed for this with a very good battery life, a low weight and a good price-performance ratio for this notebook category. The anti-glare 13.3" display, the high battery life, the low weight, the slim design and the configuration that almost satisfies completely for this price class. A lower system noise in load scenarios and a more brilliant display with a better viewing angle stability. 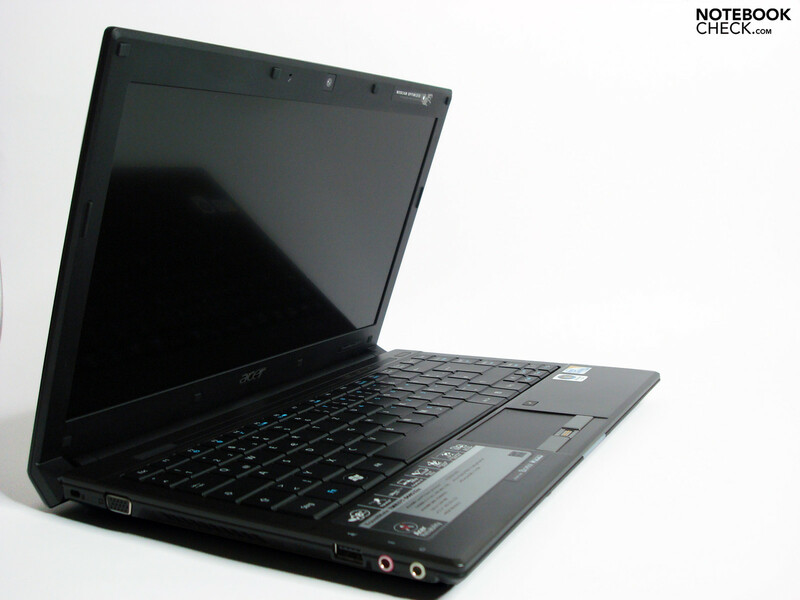 That Acer protrudes into the regions of established subnotebooks at a competitive price with its Travelmate 8371, whereas there are barely any cut backs in performance or configuration. It's own Aspire Timeline 3810T managed to come closest to our test model and is also available with a dedicated graphic, UMTS and at a somewhat lower price. The MSI X340 and the Lenovo Ideapad U350 (currently being tested) are available with only single core CPUs but don't have, just like the Aspire Timeline, a non-glare display.